Matcha green tea is a very popular drink because of its many amazing health benefits. Matcha green tea lattes or regular Matcha green tea can help you to lose weight, improve cognitive function, promote good heart health, and it has cancer-fighting properties too. Matcha green tea powder is beneficial for your health due to its high level of antioxidants. Matcha tea has many of the similar benefits of green tea. When drinking Matcha tea you also consume powdered green tea leaf, and therefore you get more of the amino acids and beneficial nutrients from the tea plant. Even though Matcha green tea contains caffeine, other compounds in the refreshing drink help to offset the effects of caffeine. In this article, I will look at the science behind the reasons why Matcha green tea is so good for you. You will also learn if drinking Matcha tea will really help you lose weight and how much Matcha tea you should drink per day. Matcha green tea is made by grinding tea leaves from the Camellia sinensis tea plant into a fine powder. Dr. Jennifer Robinson on WebMD says that about 2 weeks before the tea leaf is harvested, farmers cover the tea plants to avoid sunlight. (1) This process is critical for the unique chemical compounds in Matcha green tea to develop. During this time, antioxidants and amino acids develop and they are stronger than regular green tea. Unlike oolong tea and black tea which are fermented, tea leaves to make Matcha green tea are left to dry before being heated in ovens and then powdered. Matcha tea has a vibrant green color. Matcha literally means “powdered tea” or “rubbed tea” in Japanese. This refers to the traditional method of grinding green tea leaves into Matcha green tea powder. This means that gram for gram, Matcha green tea has more health benefits than ordinary green tea. Matcha tea is divided into 3 grades depending on the quality of the tea powder. Ceremonial grade Matcha tea. This is the highest quality tea that is often used in Japanese tea ceremonies. Ceremonial grade Matcha has the sweetest and deepest flavor. Premium grade Matcha. Most people who drink a cup of Matcha tea a day, use premium grade Matcha green tea. This is high-quality Matcha tea and contains plenty of health benefits when consumed daily. Culinary grade Matcha green tea. This type of Matcha is used together with other ingredients in cooking and baking, and can be used for drinking too. Culinary grade Matcha can be used as a natural green food coloring or to add flavor. You can use premium or culinary grade Matcha to create a delicious Matcha latte, health-boosting smoothie, or warm Matcha cappuccino. Matcha tea has a complex, “grassy” distinct flavor that has a lingering sweet aftertaste. Some people say that Matcha tea tastes like a wheatgrass or spinach. The taste of Matcha tea also depends on whether you prefer your tea hot or cold. Many people say that cold-brewed premium grade Matcha green tea has a sweeter flavor than hot Matcha green tea. The taste also depends on the Matcha grade – culinary grade Matcha tea is more bitter than premium grade Matcha tea. The Journal of Agricultural and Food Chemistry reports that Japanese green Matcha tea has an umami taste. (3) Umami is described by many as pleasant savory taste. Matcha green tea is packed full of antioxidants that have many health benefits. Matcha tea contains caffeine and has significantly higher levels of caffeine than green tea. Regular green tea contains just under 4 mg caffeine per gram of dried tea leaf. Both Matcha tea and coffee contain caffeine, polyphenols, and catechins. Coffee also has some health benefits when consumed in moderation. Even though Matcha tea contains more caffeine than green tea, Matcha caffeine content is about half of what coffee contains. There are no set guidelines on the number of cups of Matcha tea to drink daily to boost your health. Doctors from the Mayo Clinic report that adults should consume no more than 400 mg of caffeine per day. Although 2 cups of Matcha green tea would only contain around 100 mg of caffeine, most people don’t exceed drinking 2 cups of Matcha tea a day. Because Matcha tea contains 3 times more antioxidants than high-quality green tea, 2 cups of Matcha tea could contain the equivalent health benefit of 6 cups of green tea. One of the advantages of Matcha tea over green tea is that you don’t have to drink as many cups of tea to benefit from it. There are a number of ways to make your own delicious, health-boosting Matcha green tea at home. For most people, premium grade Matcha tea is the best type to use as it is not as bitter as cheaper culinary grade Matcha. To make Matcha tea the same way as they do in Japanese ceremonies, you need a tea bowl and a bamboo whisk. Place a small sifter over your tea bowl and sift 1 or 2 teaspoons premium grade Matcha green tea. Use the bamboo whisk to vigorously mix the Matcha powder in the hot water. Continue whisking in a zig-zag motion until the Matcha tea is frothy. Drink your Matcha tea straight from the bowl to enjoy all its health benefits. Consume a bowl of Matcha tea once or twice every day for best results. You can kick-start your day with a delicious Matcha latte to give your body a powerful antioxidant boost. Sift 1 or 2 teaspoons of good quality Matcha green tea into a cup. Add 3 tablespoons of warm water and use a small sift to create a paste. Warm 250 ml of milk (you can use cow’s milk or a non-dairy milk alternative) in a saucepan. When the milk is hot, slowly pour over the Matcha green tea paste into your cup, stirring all the time. Add a little bit of honey or other natural sweetener. Enjoy your hot Matcha latte every morning to help strengthen your immune system and get rid of brain fog. To make a cold Matcha latte, you just need to use cold milk instead of heating the milk up. The simplest way to get all the wonderful health benefits of Matcha tea is to make it directly in a cup. Sift 1 or 2 teaspoons of Matcha green tea powder in a cup. Add a little of the hot water and use a spoon to mix into a smooth paste. Gradually add more water until your cup is full, stirring continually. Sit back, relax, and enjoy your refreshing homemade Matcha green tea. Let’s look at some of the many reasons why drinking 1 or 2 cups of Matcha green tea every day is good for you. Compounds in Matcha green tea like EGCG, L-theanine, and caffeine help to boost your brain power. Find out what else you can do to improve your memory and reduce brain fog. Drinking a cup or two of Matcha tea every day could help to bring your blood pressure down. Learn more about how you can lower your risk of high blood pressure naturally and its associated complications. Antioxidants in Matcha green tea powder can also protect your cardiovascular health by lowering your cholesterol. If you have high cholesterol, find out what else you can do to bring down levels of LDL cholesterol. Regularly consuming Matcha green tea can also help to lower blood glucose levels, as well as lowering fat levels in blood. If you have any of the warning signs of diabetes, you should learn about foods to eat to help prevent diabetes. The anti-inflammatory and antioxidant properties of green tea extracts mean that they can play a role in certain cancer treatments. It is good to remember that, according to studies mentioned in this article, Matcha tea has 3 times the level of antioxidants than traditional green tea. Discover what foods can help reduce your risk of cancer. Tea made with Matcha green tea powder also can promote good liver and kidney health and help get rid of toxins from your body. Find out how to strengthen the health of your liver and also avoid habits that can damage your liver. If you are trying to lose weight, then drinking a cup of Matcha tea first thing in the morning could boost your weight loss efforts. To help lose more weight quicker, you can try these 12 simple tweaks for weight loss. Matcha tea is full of antioxidants that have tremendous benefit to your health. For most people, drinking 1 or 2 cups of Matcha green tea help to strengthen their immunity and also improve their general health. If you already have high blood pressure, the caffeine content in Matcha green tea could cause your blood pressure to rise. However, regularly consuming green tea seems to have an anti-hypertension effect. Anxiety disorders. Green tea and Matcha green tea are stimulants and, in some people, may exacerbate existing anxiety disorders. In many people, though, green tea does have a calmative effect. Blood glucose control. Matcha tea can help to lower blood glucose levels. So, if you take diabetes medication and regularly drink Matcha green tea, you should regularly monitor your blood sugar. Irritable bowel syndrome (IBS). Matcha green tea contains caffeine that could make some of your IBS symptoms worse. Risk of osteoporosis. Drinking more than 3 or 4 cups of Matcha green tea per day could cause weakened bones. Green tea causes calcium to get flushed out of your body and you shouldn’t consume more than 3 cups of green tea a day if you are at risk of osteoporosis. There is a small risk of lead contamination if you regularly drink Matcha green tea. Tea plants absorb both beneficial minerals and heavy metals from the soil. 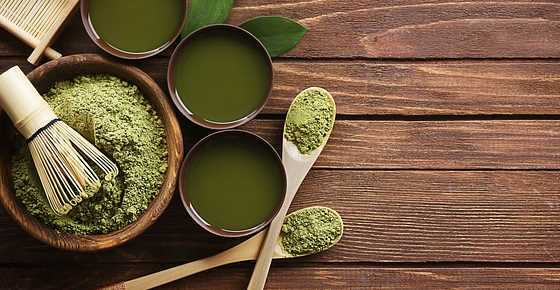 If you want to consume a cup of delicious Matcha green tea a day to boost your health, you should look for high-quality, organic premium grade Matcha green tea powder. Matcha green tea is available as a powder and can be found in health food stores and online. Its best to buy organic matcha, because it is produced without any artificial fertilizers, herbicides or pesticides like this tea. MATCHA green tea…MATCHA is the brand name? Hi Jaime, matcha is not the brand name but the name of the tea (the tea type itself). Hi Donna, you can add matcha powder to smoothies. Hi Jessie, you don’t have to buy matcha tea online. Matcha tea is often hard to get and most supermarkets don’t stock it. If you don’t have a health store in your area and cannot get it somewhere else, you can try online. What are your thoughts on the matcha powder that Starbucks uses? Can you also describe the flavor profile and texture? I want to give it a try – but have been hesitant. Thank you for the nice article. Hi Kris, I’m not sure about the powder that Starbucks use as I don’t buy there. It’s also hard to describe flavor as it is very individual. It may take a while for some people to get used to the taste. Quality matcha should be bright green with fresh and vegetal scent. Inferior matcha tastes unpleasantly bitter unlike a quality matcha. Best to buy a small quantity and try. My concern is the fact this product is from China .. and they are a known heavy user of pesticides .. do we know that their green tea / matcha tea is not heavily doused with pesticides? I have been drinking Matcha everyday for 2 1/2 years and never get a cold or flu..coincidence maybe, but I have been around a lot of sick people and really believe in Matcha. I choose Starbucks because it is easy. Try a Grande Green Tea Latte, with no syrup (no sugar) and ask for 6 scoops of Matcha. So amazing and healthy. Starbucks Matcha has sugar already in it, so make sure they dont at the syrup also because then it is way too sweet.